A new super PAC in Hawaii working for change this election has already seen it — in its own name. All Hawaii Stand Together, the political action committee that Civil Beat first reported about in May, decided last week to switch its name to Be Change Now, according to the state Campaign Spending Commission. The group was formed by Josh Magno of Pacific Resource Partnership, which in past elections has tapped the Hawaii Regional Council of Carpenters labor union to create super PACs that spent millions of dollars defeating anti-rail candidates for Honolulu mayor and county council races. 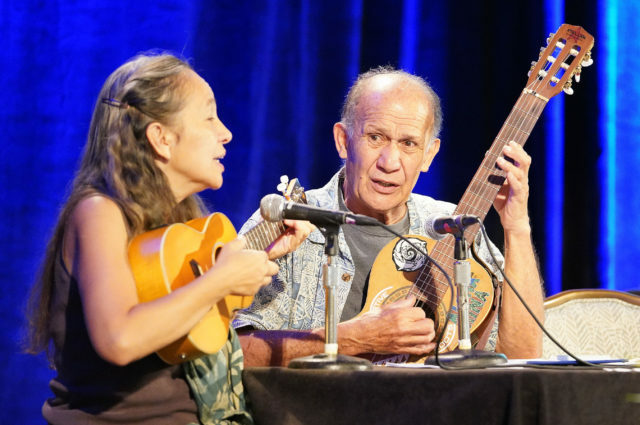 Liko Martin, right, sings with Laulani Teale at the Hawaii Democratic Party convention in May at the Waikaloa Resort in Kona. This time around, Be Change Now is working independently to help elect state Sen. Josh Green as lieutenant governor in the Aug. 11 primary. He’s in a tough race against several other Democratic candidates, including state Sen. Jill Tokuda, recently retired Sen. Will Espero, Kauai Mayor Bernard Carvalho Jr. and former Board of Education member Kim Coco Iwamoto. Representatives of the group, which can spend unlimited amounts of money on ads to sway voters but by law is prohibited from coordinating with a candidate’s campaign, did not return messages seeking comment. Its former name came up as an issue during the Hawaii Democratic Party convention two weeks ago in Kona. Singer-songwriter Liko Martin, who wrote the popular tune “All Hawaii Stand Together,” provided music with Laulani Teale at the convention as delegates arrived May 27. Teale took a moment before playing the song, which had been requested, to make clear that they were in no way affiliated with or supportive of the super PAC that took the song’s name without Martin’s permission, according to a video of her remarks as well as a delegate who was there. “It’s simply not right,” she told those in attendance. In an interview Tuesday, Teale said the pro-development groups behind the super PAC are on a mission contrary to what Martin believes. He has long performed songs like “All Hawaii Stand Together” and “Waimanalo Blues” that are about unity and culture. Teale said the musicians have been complaining about the PAC using the song title for the past few weeks — since they learned about it from Civil Beat. State Sen. Josh Green, who’s running for lieutenant governor, is the only candidate the super PAC has supported to date. 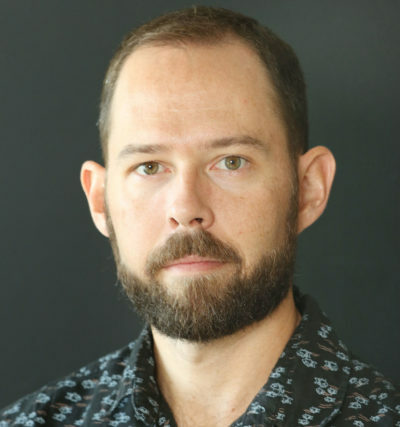 Teale said the song’s name was inappropriately used in the past as part of a campaign in favor of giving federal recognition to Native Hawaiians. She supports Hawaiian sovereignty and opposed creating a nation within a nation, similar to what Native Americans have. It was during that fight that Teale became Martin’s kako’o (advisor), providing assistance for him. Bart Dame, a longtime progressive Democratic activist who heard her comments at the convention, said her remarks were very good. He described PRP as the “Pave Oahu Ohana,” saying it was “cynical” for the super PAC to be called All Hawaii Stand Together. Dame, like Teale, said he was glad to learn the group had changed its name. In an interview Tuesday, Green said he only learned of Be Change Now’s support for his campaign after his mother called him to say she saw the group’s ad on CNN. The short ad shows someone who appears to be a teacher saying Green has had a good record fighting for higher salaries for educators and supporting debt-free college, according to people familiar with the ad. 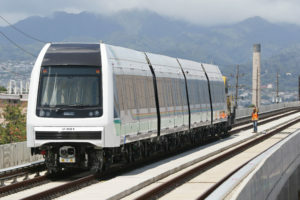 While the super PAC’s only ad to air thus far is not related to rail, Green supports building the 20-mile line from Kapolei to Ala Moana. But last year he voted against the Legislature’s bailout package for the now $8 billion project. 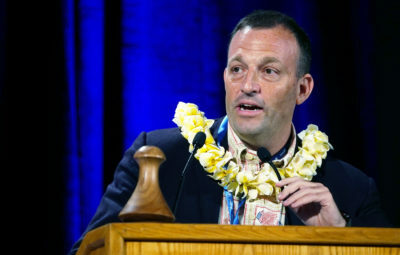 The Big Island physician has said he was against raising the state hotel tax on the neighbor islands to cover the shortfall. The carpenters council, which represents some 7,000 workers, has spent heavily in past political contests. It put more than $4 million into the past three elections by funneling money through its Hawaii Carpenters Market Recovery Program Fund into the Pacific Resource Partnership PAC in 2012 and the renamed Forward Progress PAC in 2014 and 2016. Both PACs have since been terminated. The union, which has endorsed Green for LG and Congresswoman Colleen Hanabusa for governor, had $45 million cash on hand as of Dec. 31, U.S. Department of Labor reports show. “I’m honored to have support from anyone and everyone, so getting the support from the carpenters, teachers and doctors and other people is humbling,” Green said.